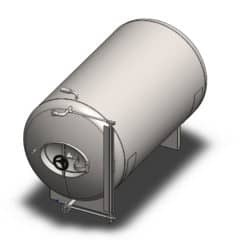 This category includes the pressure stainless steel tanks with the horizontal orientation without the PUR insulation, without the cooling channels. The non-insulated beer maturation tanks without insulation are cooled by air in the cold room (such as a brewery cellar). We produce all these devices either in model configurations or according to individual customer requirements. For example, we can equippe this type of the tanks also with additional armatures for filtration of beverages or for the extraction of hops into cold beer (dry hopping). The combi multifunction Maturation lager tank & Bright beer tank (called also Lager tank, Secondary fermentation tank, Beer pressure tank, Lagering tank, Pressure fermenter) . This type of the beverage-production tank is equipped with a horizontal stackable construction, it is without insulation therefore it is designed to cooling by air from outside space. This tank has usable volume 100 liters and total volume 120 liters, that is designed to secondary fermentation (maturation process) of the alcoholic beverage products, storage, tapping, carbonation, filtration of beer, cider, wine and other beverages under pressure, and also for preparation of beverages before their bottling or filling into kegs in several variants, made of stainless food steel DIN 1.4301 (AISI 304). The vessel is manufactured containing standardized dimensions and equipment, or according to individual customer requirements. The tank is normally available in several versions (optional dimensions, quality class, maximum pressure). Classic design. PED certificate (optional also GUM, GOST). All parts are made in European Union. The pressure tank is fully manufactured in accordance with European Standards EN 13445 and PED 2014/68/EU. The combi multifunction Maturation lager tank & Bright beer tank (called also Lager tank, Secondary fermentation tank, Beer pressure tank, Lagering tank, Pressure fermenter) . This type of the beverage-production tank is equipped with a horizontal stackable construction, it is without insulation therefore it is designed to cooling by air from outside space. This tank has usable volume 150 liters and total volume 177 liters, that is designed to secondary fermentation (maturation process) of the alcoholic beverage products, storage, tapping, carbonation, filtration of beer, cider, wine and other beverages under pressure, and also for preparation of beverages before their bottling or filling into kegs in several variants, made of stainless food steel DIN 1.4301 (AISI 304). The vessel is manufactured containing standardized dimensions and equipment, or according to individual customer requirements. The tank is normally available in several versions (optional dimensions, quality class, maximum pressure). Classic design. PED certificate (optional also GUM, GOST). All parts are made in European Union. The pressure tank is fully manufactured in accordance with European Standards EN 13445 and PED 2014/68/EU. The combi multifunction Maturation lager tank & Bright beer tank (called also Lager tank, Secondary fermentation tank, Beer pressure tank, Lagering tank, Pressure fermenter) . This type of the beverage-production tank is equipped with a horizontal stackable construction, it is without insulation therefore it is designed to cooling by air from outside space. This tank has usable volume 200 liters and total volume 233 liters, that is designed to secondary fermentation (maturation process) of the alcoholic beverage products, storage, tapping, carbonation, filtration of beer, cider, wine and other beverages under pressure, and also for preparation of beverages before their bottling or filling into kegs in several variants, made of stainless food steel DIN 1.4301 (AISI 304). The vessel is manufactured containing standardized dimensions and equipment, or according to individual customer requirements. The tank is normally available in several versions (optional dimensions, quality class, maximum pressure). Classic design. PED certificate (optional also GUM, GOST). All parts are made in European Union. The pressure tank is fully manufactured in accordance with European Standards EN 13445 and PED 2014/68/EU. The combi multifunction Maturation lager tank & Bright beer tank (called also Lager tank, Secondary fermentation tank, Beer pressure tank, Lagering tank, Pressure fermenter) . This type of the beverage-production tank is equipped with a horizontal stackable construction, it is without insulation therefore it is designed to cooling by air from outside space. This tank has usable volume 250 liters and total volume 290 liters, that is designed to secondary fermentation (maturation process) of the alcoholic beverage products, storage, tapping, carbonation, filtration of beer, cider, wine and other beverages under pressure, and also for preparation of beverages before their bottling or filling into kegs in several variants, made of stainless food steel DIN 1.4301 (AISI 304). The vessel is manufactured containing standardized dimensions and equipment, or according to individual customer requirements. The tank is normally available in several versions (optional dimensions, quality class, maximum pressure). Classic design. PED certificate (optional also GUM, GOST). All parts are made in European Union. The pressure tank is fully manufactured in accordance with European Standards EN 13445 and PED 2014/68/EU. The combi multifunction Maturation lager tank & Bright beer tank (called also Lager tank, Secondary fermentation tank, Beer pressure tank, Lagering tank, Pressure fermenter) . This type of the beverage-production tank is equipped with a horizontal stackable construction, it is without insulation therefore it is designed to cooling by air from outside space. This tank has usable volume 300 liters and total volume 332 liters, that is designed to secondary fermentation (maturation process) of the alcoholic beverage products, storage, tapping, carbonation, filtration of beer, cider, wine and other beverages under pressure, and also for preparation of beverages before their bottling or filling into kegs in several variants, made of stainless food steel DIN 1.4301 (AISI 304). The vessel is manufactured containing standardized dimensions and equipment, or according to individual customer requirements. The tank is normally available in several versions (optional dimensions, quality class, maximum pressure). Classic design. PED certificate (optional also GUM, GOST). All parts are made in European Union. The pressure tank is fully manufactured in accordance with European Standards EN 13445 and PED 2014/68/EU. 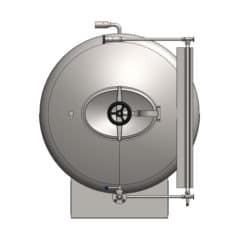 The combi multifunction Maturation lager tank & Bright beer tank (called also Lager tank, Secondary fermentation tank, Beer pressure tank, Lagering tank, Pressure fermenter) . This type of the beverage-production tank is equipped with a horizontal stackable construction, it is without insulation therefore it is designed to cooling by air from outside space. This tank has usable volume 400 liters and total volume 464 liters, that is designed to secondary fermentation (maturation process) of the alcoholic beverage products, storage, tapping, carbonation, filtration of beer, cider, wine and other beverages under pressure, and also for preparation of beverages before their bottling or filling into kegs in several variants, made of stainless food steel DIN 1.4301 (AISI 304). The vessel is manufactured containing standardized dimensions and equipment, or according to individual customer requirements. The tank is normally available in several versions (optional dimensions, quality class, maximum pressure). Classic design. PED certificate (optional also GUM, GOST). All parts are made in European Union. The pressure tank is fully manufactured in accordance with European Standards EN 13445 and PED 2014/68/EU. The combi multifunction Maturation lager tank & Bright beer tank (called also Lager tank, Secondary fermentation tank, Beer pressure tank, Lagering tank, Pressure fermenter) . This type of the beverage-production tank is equipped with a horizontal stackable construction, it is without insulation therefore it is designed to cooling by air from outside space. This tank has usable volume 500 liters and total volume 618 liters, that is designed to secondary fermentation (maturation process) of the alcoholic beverage products, storage, tapping, carbonation, filtration of beer, cider, wine and other beverages under pressure, and also for preparation of beverages before their bottling or filling into kegs in several variants, made of stainless food steel DIN 1.4301 (AISI 304). The vessel is manufactured containing standardized dimensions and equipment, or according to individual customer requirements. The tank is normally available in several versions (optional dimensions, quality class, maximum pressure). Classic design. PED certificate (optional also GUM, GOST). All parts are made in European Union. The pressure tank is fully manufactured in accordance with European Standards EN 13445 and PED 2014/68/EU. The combi multifunction Maturation lager tank & Bright beer tank (called also Lager tank, Secondary fermentation tank, Beer pressure tank, Lagering tank, Pressure fermenter) . This type of the beverage-production tank is equipped with a horizontal stackable construction, it is without insulation therefore it is designed to cooling by air from outside space. This tank has usable volume 600 liters and total volume 744 liters, that is designed to secondary fermentation (maturation process) of the alcoholic beverage products, storage, tapping, carbonation, filtration of beer, cider, wine and other beverages under pressure, and also for preparation of beverages before their bottling or filling into kegs in several variants, made of stainless food steel DIN 1.4301 (AISI 304). The vessel is manufactured containing standardized dimensions and equipment, or according to individual customer requirements. The tank is normally available in several versions (optional dimensions, quality class, maximum pressure). Classic design. PED certificate (optional also GUM, GOST). All parts are made in European Union. The pressure tank is fully manufactured in accordance with European Standards EN 13445 and PED 2014/68/EU. The combi multifunction Maturation lager tank & Bright beer tank (called also Lager tank, Secondary fermentation tank, Beer pressure tank, Lagering tank, Pressure fermenter) . This type of the beverage-production tank is equipped with a horizontal stackable construction, it is without insulation therefore it is designed to cooling by air from outside space. This tank has usable volume 750 liters and total volume 869 liters, that is designed to secondary fermentation (maturation process) of the alcoholic beverage products, storage, tapping, carbonation, filtration of beer, cider, wine and other beverages under pressure, and also for preparation of beverages before their bottling or filling into kegs in several variants, made of stainless food steel DIN 1.4301 (AISI 304). The vessel is manufactured containing standardized dimensions and equipment, or according to individual customer requirements. The tank is normally available in several versions (optional dimensions, quality class, maximum pressure). Classic design. PED certificate (optional also GUM, GOST). All parts are made in European Union. The pressure tank is fully manufactured in accordance with European Standards EN 13445 and PED 2014/68/EU. The combi multifunction Maturation lager tank & Bright beer tank (called also Lager tank, Secondary fermentation tank, Beer pressure tank, Lagering tank, Pressure fermenter) . This type of the beverage-production tank is equipped with a horizontal stackable construction, it is without insulation therefore it is designed to cooling by air from outside space. This tank has usable volume 800 liters and total volume 959 liters, that is designed to secondary fermentation (maturation process) of the alcoholic beverage products, storage, tapping, carbonation, filtration of beer, cider, wine and other beverages under pressure, and also for preparation of beverages before their bottling or filling into kegs in several variants, made of stainless food steel DIN 1.4301 (AISI 304). The vessel is manufactured containing standardized dimensions and equipment, or according to individual customer requirements. The tank is normally available in several versions (optional dimensions, quality class, maximum pressure). Classic design. PED certificate (optional also GUM, GOST). All parts are made in European Union. The pressure tank is fully manufactured in accordance with European Standards EN 13445 and PED 2014/68/EU. The combi multifunction Maturation lager tank & Bright beer tank (called also Lager tank, Secondary fermentation tank, Beer pressure tank, Lagering tank, Pressure fermenter) . This type of the beverage-production tank is equipped with a horizontal stackable construction, it is without insulation therefore it is designed to cooling by air from outside space. This tank has usable volume 1000 liters and total volume 1203 liters, that is designed to secondary fermentation (maturation process) of the alcoholic beverage products, storage, tapping, carbonation, filtration of beer, cider, wine and other beverages under pressure, and also for preparation of beverages before their bottling or filling into kegs in several variants, made of stainless food steel DIN 1.4301 (AISI 304). The vessel is manufactured containing standardized dimensions and equipment, or according to individual customer requirements. The tank is normally available in several versions (optional dimensions, quality class, maximum pressure). Classic design. PED certificate (optional also GUM, GOST). All parts are made in European Union. The pressure tank is fully manufactured in accordance with European Standards EN 13445 and PED 2014/68/EU. The combi multifunction Maturation lager tank & Bright beer tank (called also Lager tank, Secondary fermentation tank, Beer pressure tank, Lagering tank, Pressure fermenter) . This type of the beverage-production tank is equipped with a horizontal stackable construction, it is without insulation therefore it is designed to cooling by air from outside space. This tank has usable volume 1200 liters and total volume 1400 liters, that is designed to secondary fermentation (maturation process) of the alcoholic beverage products, storage, tapping, carbonation, filtration of beer, cider, wine and other beverages under pressure, and also for preparation of beverages before their bottling or filling into kegs in several variants, made of stainless food steel DIN 1.4301 (AISI 304). The vessel is manufactured containing standardized dimensions and equipment, or according to individual customer requirements. The tank is normally available in several versions (optional dimensions, quality class, maximum pressure). Classic design. PED certificate (optional also GUM, GOST). All parts are made in European Union. The pressure tank is fully manufactured in accordance with European Standards EN 13445 and PED 2014/68/EU. The combi multifunction Maturation lager tank & Bright beer tank (called also Lager tank, Secondary fermentation tank, Beer pressure tank, Lagering tank, Pressure fermenter) . This type of the beverage-production tank is equipped with a horizontal stackable construction, it is without insulation therefore it is designed to cooling by air from outside space. This tank has usable volume 1500 liters and total volume 1717 liters, that is designed to secondary fermentation (maturation process) of the alcoholic beverage products, storage, tapping, carbonation, filtration of beer, cider, wine and other beverages under pressure, and also for preparation of beverages before their bottling or filling into kegs in several variants, made of stainless food steel DIN 1.4301 (AISI 304). The vessel is manufactured containing standardized dimensions and equipment, or according to individual customer requirements. The tank is normally available in several versions (optional dimensions, quality class, maximum pressure). Classic design. PED certificate (optional also GUM, GOST). All parts are made in European Union. The pressure tank is fully manufactured in accordance with European Standards EN 13445 and PED 2014/68/EU. The combi multifunction Maturation lager tank & Bright beer tank (called also Lager tank, Secondary fermentation tank, Beer pressure tank, Lagering tank, Pressure fermenter) . This type of the beverage-production tank is equipped with a horizontal stackable construction, it is without insulation therefore it is designed to cooling by air from outside space. This tank has usable volume 3000 liters and total volume 3130 liters, that is designed to secondary fermentation (maturation process) of the alcoholic beverage products, storage, tapping, carbonation, filtration of beer, cider, wine and other beverages under pressure, and also for preparation of beverages before their bottling or filling into kegs in several variants, made of stainless food steel DIN 1.4301 (AISI 304). The vessel is manufactured containing standardized dimensions and equipment, or according to individual customer requirements. The tank is normally available in several versions (optional dimensions, quality class, maximum pressure). Classic design. PED certificate (optional also GUM, GOST). All parts are made in European Union. The pressure tank is fully manufactured in accordance with European Standards EN 13445 and PED 2014/68/EU. The combi multifunction Maturation lager tank & Bright beer tank (called also Lager tank, Secondary fermentation tank, Beer pressure tank, Lagering tank, Pressure fermenter) . This type of the beverage-production tank is equipped with a horizontal stackable construction, it is without insulation therefore it is designed to cooling by air from outside space. This tank has usable volume 4000 liters and total volume 4258 liters, that is designed to secondary fermentation (maturation process) of the alcoholic beverage products, storage, tapping, carbonation, filtration of beer, cider, wine and other beverages under pressure, and also for preparation of beverages before their bottling or filling into kegs in several variants, made of stainless food steel DIN 1.4301 (AISI 304). The vessel is manufactured containing standardized dimensions and equipment, or according to individual customer requirements. The tank is normally available in several versions (optional dimensions, quality class, maximum pressure). Classic design. PED certificate (optional also GUM, GOST). All parts are made in European Union. The pressure tank is fully manufactured in accordance with European Standards EN 13445 and PED 2014/68/EU. The combi multifunction Maturation lager tank & Bright beer tank (called also Lager tank, Secondary fermentation tank, Beer pressure tank, Lagering tank, Pressure fermenter) . This type of the beverage-production tank is equipped with a horizontal stackable construction, it is without insulation therefore it is designed to cooling by air from outside space. This tank has usable volume 5000 liters and total volume 5900 liters, that is designed to secondary fermentation (maturation process) of the alcoholic beverage products, storage, tapping, carbonation, filtration of beer, cider, wine and other beverages under pressure, and also for preparation of beverages before their bottling or filling into kegs in several variants, made of stainless food steel DIN 1.4301 (AISI 304). The vessel is manufactured containing standardized dimensions and equipment, or according to individual customer requirements. The tank is normally available in several versions (optional dimensions, quality class, maximum pressure). Classic design. PED certificate (optional also GUM, GOST). All parts are made in European Union. The pressure tank is fully manufactured in accordance with European Standards EN 13445 and PED 2014/68/EU.